The Scrub GLD has an overall board weight of just 7.1 kg with it's composite deck. The GLD-DH by Scrub is our top level kiteboard ATB. This makes it a top level mountainboard designed to take your landboarding to the next level! The Scrub GLD also features a brand new skate truck system. This board comes as standard with the Boost light top adjustable channel truck for instant tweaks that may be needed. At 102cm long, the composite deck is extremely maneuverable. 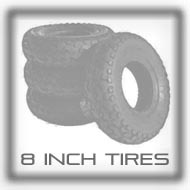 8" Scrub lightweight tires are fitted as standard. They feature an open tread pattern that clears ground debris easily. The 7mm thick, highly flexible, and durable composite deck is very light and gives superior performance with a maneuverable ride. The Scrub GLD-DH an all-new Active Yaw Control built into the decks construction and is the technology that's reduces the "yaw or twist" in the deck allowing the rider to hold down more power, hold a better edge or line and have better feedback from the board at all times. The New Scrub Ratchet bindings offer a Professional fit for increased comfort and performance. All Scrub boards come supplied with a full tool kit, instructions and coil leash. Eight inch tires give the rider a stabile ride over most obstacles with enough clearance from smaller objects. The benefit over taller tires is that you are light and small enough to be used for jumping / freestyle tricks. Best suited for asphalt, grass and hard to medium packed sand areas. 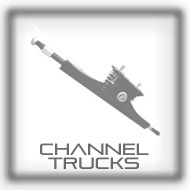 Channel Trucks incorporate springs and sometimes dampeners allowing you to customise the feel of your board. This truck is suited for riders who require extra strength and who want to carve, cruise and have a stable feel to their ride. 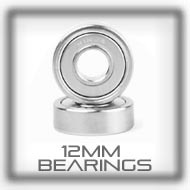 12mm x 28mm bearings gives the rider a durable and use flexible board. Great for kiteboarding and downhill mountainboard riders of all skill levels while not sacrificing the ability to load up the mountainboard for high carving turns and jumps. 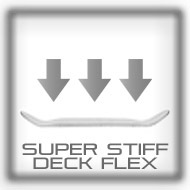 Super stiff flex gives the board better response and pop which is better suited to freestyle / trick riding. The decks direct feel will allow for a more crisp feeling and super fast turning. Stiffer mountainboards will also provide more stability at higher speeds.